The Agile Project Manager—No Upfront Estimates! The diagram represents the Cone of Uncertainty—coined by Steve McConnell of Construx. I’m sure he’s not the first or only one to reference the cone, but he famously has connected it with software development. The cone indicates the futility of estimating & committing to software projects at project initiation—not matter how well conceived the estimates are. There’s typically too much uncertainty to be accurate. 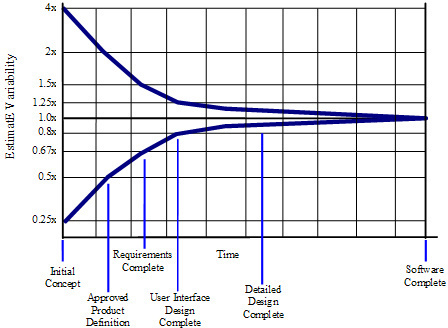 Instead, an iterative or incremental approach will glean more information to improve the estimates over time. This is particularly true for projects that include new technologies, new teams, or trying to create novel or innovative products. I’ve been managing software projects for much of my career. Early on, I spent most of my time trying to estimate projects more and more effectively. I pulled together models for how to estimate. I kept track of historical estimate vs. actual data, so that I could evaluate the quality of my estimates. I even tried some modeling or arithmetic techniques to fine tune my estimates. Some of these are quite well know techniques like Function Points or Cocomo or the Personal Software Process. All of this was focused towards estimate quality…not software product quality. I was worrying about how to represent the time to build the software to stakeholders and accountants so that we could reasonably know how much it would cost. Then we could make better decisions around whether to start it or not. The odd thing, at least in my experience was that no matter neither how hard we tried nor how much effort we expended on estimation and planning, over 60% of our projects went awry. They failed. They were Death Marches. They were incredibly painful. And in many cases, they resulted in people losing their jobs. I guess my point is—accurate software project estimation is incredibly hard.